Disposable foam ear plugs are soft and comfortable, and come in a variety of colors, sizes, shapes and materials. Foam ear plugs are great for sleeping (especially if your someone snores!) studying, motorcycle riding, shooting, and working or playing in noisy places. Whether you are an individual who needs just a few pairs or an organization that needs thousands of pairs of ear plugs, we let you buy exactly what you need, from a single pair to thousands of pairs. We stock most of the available ear plugs in the market, and in most cases we can special order any that we do not already have on hand. Here you will find our tremendous selection of foam earplugs in case quantities at our very best quantity discount prices. 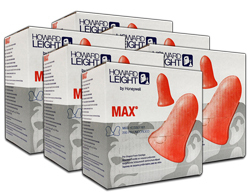 (NRR 32) Got Ears?® Red Hots UF foam ear plugs are an excellent high noise hearing protector at NRR 32. The ultra soft slow recovery foam makes them ideal for general purpose use including work, sleeping, and shooting. Case of 1000 individually wrapped pairs - Best Pricing! Best Pricing! Case of 1000 pairs. (NRR 32) Got Ears? Snow White UF foam ear plugs provide excellent protection from sound, making them perfect for sleep, work, and most noisy activities. Comfortable, soft, slow recovery foam. Case of 1000 individually wrapped pairs - Best Pricing! Case of 1000 individually wrapped pairs - Best Pricing! (NRR 30) Got Ears?® Round-30™ PVC Ear Plugs feature an unusually high NRR 30, a simple cylindrical design, neon orange high visibility color and thermo-reactive formulation. Case of 2000 Pairs in unprinted poly bags - Best Pricing! (NRR 30) Hearos SoftStar NexGen foam ear plugs provide the smooth roll-down of a cylindrical (barrel) design, with the softness of PVC-free UF foam. Star indicates proper method of insertion. Smooth skin for reduced irritation. Case of 2000 pairs. (NRR 32) Elvex Blue™ UF foam ear plugs feature a slow expansion, low pressure, polyurethane foam that helps users get a proper deep-in-the canal fit, and provides for all day comfort. Best Pricing! - Case of 2000 Pairs. (NRR 33) SparkPlugs® UF Foam ear plugs are random colors for a little fun, and their great performance and average to large fit means no compromise. Excellent all-around choice. Case of 2000 Pairs - Best Pricing! (NRR 33) Extra-soft low pressure foam and tapered fit for extended comfort. Case of 2000 Pairs - Best Pricing!